Green Wood-Hoopoe ( Phoeniculus purpureus fam. Phoeniculidae) Kruger Park Birds & Birding. The Green Wood-Hoopoe (Latin name Phoeniculus purpureus) is described in Roberts Birds of Southern Africa, 7th Edition. This bird has a unique Roberts number of 452 and you will find a full description of this bird on page 162 also a picture of the Green Wood-Hoopoe on page 161. The Green Wood-Hoopoe belongs to the family of birds classified as Phoeniculidae. According to the Percy FitzPatrick Institute of African Ornithology the Green Wood-Hoopoe is also known by these other names: Wood-Hoopoe, Senegal Wood-Hoopoe. The Green Wood-Hoopoe is neither Endemic or near Endemic to the Kruger National Park. It is however a common resident. It is a special bird in my opinion with beautifully coloured plumage and flight feathers. It's red bill is a great identifier. You'll find this bird all over the Park. The Green Wood-Hoopoe is monogamous unless its mate dies. In the event of a partner dying Phoeniculus purpureus will seek out a new mate. 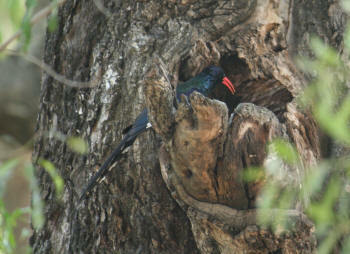 The nest of the Green Wood-Hoopoe is built in a hole in a tree trunk. The bird lays 2 to 4 eggs which are green in colour. The preferred habitats for Green Wood-Hoopoe are: woodlands and grasslands and riverine areas. You will normally see the Green Wood-Hoopoe in pairs or flocks and not as single birds.